I mentioned on the Princess Polish Facebook page that I would be doing a different Easter-themed manicure Monday-Friday to give you some inspiration for Easter Sunday. But I need something to post on Saturday and that's where you come in! Please email me (PrincessPolishBlog@gmail.com) your best Easter mani idea and I will post the top five on Saturday! You can submit them to me through Friday 4/6 at 8pm EST, when the contest will close. I'll be sending each winner a surprise polish in the mail, so be sure to enter! As you all know by now, my love for Zoya is unending. Hence, my Beach and Surf Collection giveaway. So upon rifling through my personal collection, I came to realize that the shades I owned the most of were Zoya blues. 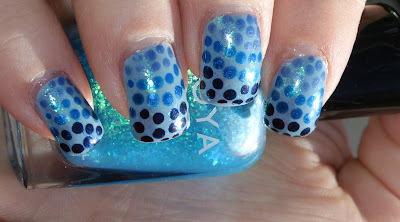 I didn't have the patience to sit and use a cosmetic sponge to do an actual blue gradient like the one I did last fall. So I decided the next best thing would be gradient dots. Going through my polish, I tried to shades that flowed well together and finally made up my mind. From left to right, I picked out Ibiza, Tart, Tallulah, Jo, Kristen, and later on, Maisie. I didn't quite know what I wanted to use as the base color for the five, then I realized I could use Kristen as the base. Since I've been dying to get some use out of Maisie, I put on two coats of her after two coats of Kristen. And here is the mani in the sun! You can really see the fleck effect from Maisie! Would this be something you would wear for Easter? If you decide to try it, please feel free to post the picture on the Facebook page! I love how you can see the effects of Maisie underneath!